We look forward to seeing you here for one of our 2016 events! For more information on upcoming events, please give us a call at 209.245.6307. Heat oven to 350°F (325°F for dark or nonstick pan). Place paper baking cup in each of 24 regular-size muffin cups. Make cake batter as directed on box, using cake mix, water, 1/2 cup Amador Foothill Zinfandel, oil and eggs. Stir in chocolate chips. Divide batter evenly among muffin cups (about two-thirds full). In large bowl, beat powdered sugar, butter, cocoa and salt with electric mixer on low speed until blended. Beat in 1/2 cup Amador Foothill Zinfandel. If frosting is too thick, beat in more wine a few drops at a time. Frost cupcakes. Recipe from Betty Crocker; modified by Amador Foothill. 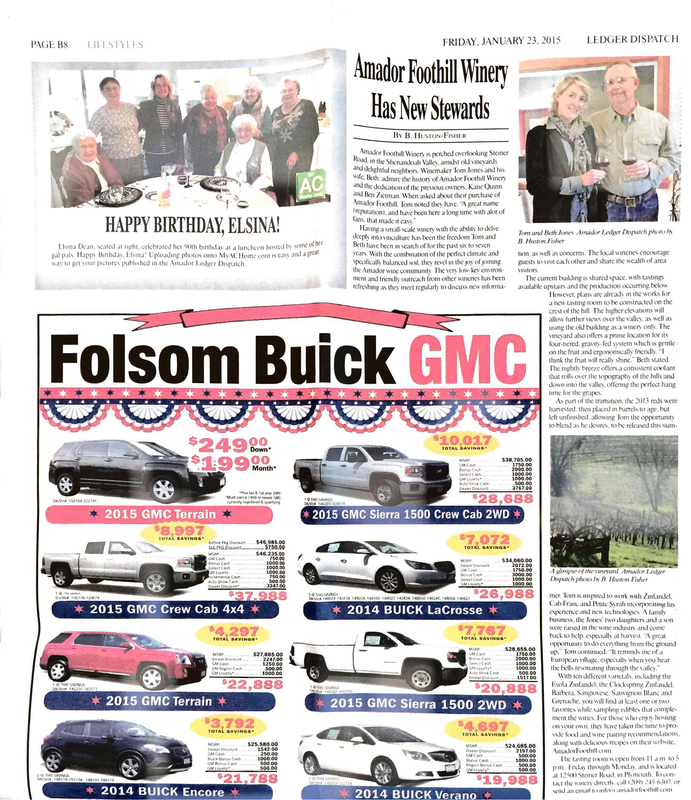 A great article by Shelley Mitchell in the Amador Ledger Dispatch on Tom Jones’ second harvest as owner and winemaker at the Amador Foothill Winery. View the full article. 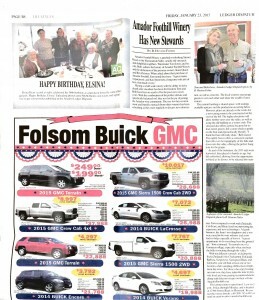 A great article by Mike Dunne from The Sacramento Bee on the Amador Four Fires event and the wines he found most exciting during the tasting. 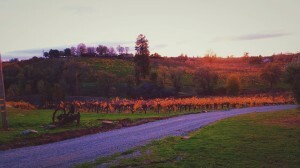 View the full article and the great notes on our Esola Vineyard (Old Vine) Zinfandel. 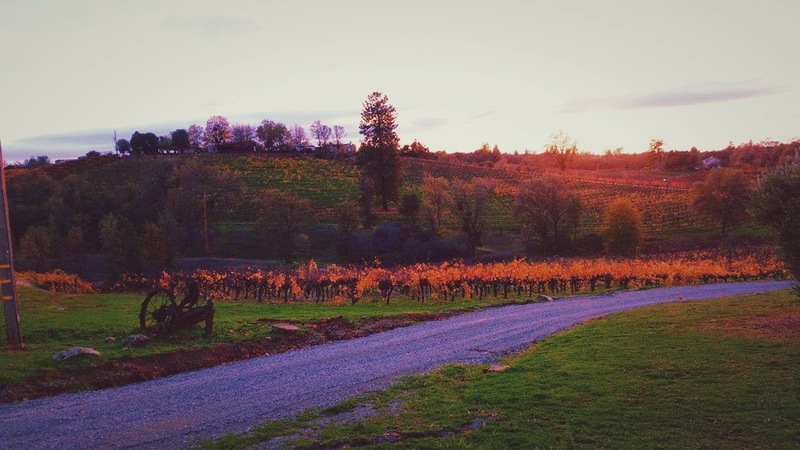 Perched on top of one of the highest points in Amador’s Shenandoah Valley for more than three decades, Amador Foothill Winery in Plymouth has a simple charm all its own. 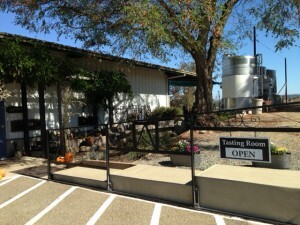 That’s what attracted winemaker Tom Jones and his wife Beth to purchase the winery and vineyards in the fall of 2014 and allow a new Read more. Dredge 1 pound shredded Swiss cheese thoroughly with 1 tablespoon flour. Bring 1 cup of Amador Foothill Semillon almost to boiling point in garlic rubbed cooking dish. Add cheese and stir with fork until melted. Add salt, pepper and nutmeg to taste. Place a fondue pot in the middle of the table. Pour cheese mixture into the pot and place over a gentle heat source. Arrange bread on a platter and serve with the fondue for dipping. For other dippers, try apple slices, pretzels, new potatoes (boiled until tender), and steamed cauliflower and carrots. Pair with Amador Foothill Semillon. Serves 3. 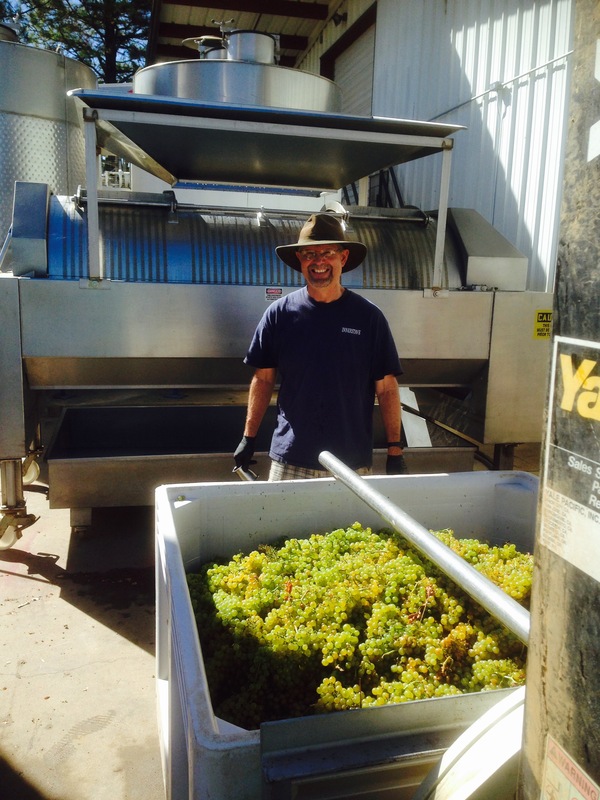 This 100% varietal Semillon is from our estate vines planted in 1981. Twenty five percent was aged in French oak. The rest was aged in stainless steel. The citrus and spice flavors are superb with asparagus, crab, shellfish and other seafood. This is a limited bottling of 94 cases.